to their shapes we are nourished. searing the curves of a curling dogwood? a single white whooping crane in the flock. I am living at the edge of a new leaf. published by Copper Canyon Press, 1998. Copyright © 1998 by Arthur Sze. i discovered a cool blog today; its author and i sometimes think alike. I am thoroughly enjoying your posts! 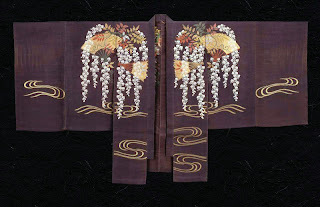 I spent a summer in Japan years ago and have always admired anything Japanese. thank you, willow. how lovely for you! where did you stay? The clothing is just beautiful. So graceful and elegant! Thank you for sharing it! 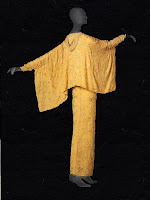 i was sitting there looking at these gowns, trying to figure out what they reminded me of, and suddenly i know. and then they really reminded me of them. 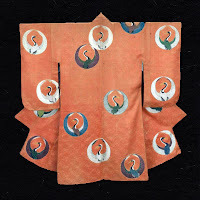 do you think maybe the japanese originally designed the kimono after the cranes? merci beaucoup, scheharazade, et bien venue! 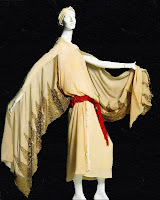 Many apologies for my belated acknowledgment of your comments on orange-tinted glasses about the kimono pattern book print. I continue to be impressed by the way you tie in japonisme to so many areas. I bet you can help!